Plan agreed...we fling all our baggage into the boot of the Ambassador [Indian variant of the Morris Oxford M3], lurch into the rapidly thickening traffic, and we're off! Ray: In India, Larry, you are rarely far from crowds of people...see the next several posts. ça me fait drôle de voir la conduite à gauche. Ray: Environ 50% des pays travaillent de cette façon, Martine ... y compris l'Inde et la Thaïlande. Approximately 50% of countries work this way, Martine...including India and Thailand. It all looks rather busy. Is the rail line still used? I wonder how much hay they had on the truck when it started its run? Ray: There are still many tram-lines operating in Kolkata, Alan. I suppose it is possible the hay-load was tied down for the trip into town from the farm. This looks to be an awful intriguing mess of a place. Good for smog enthusiasts and photographers..
Ray: I have been to India several times, Chris...work and travel...every region I have visited I have observed to be a messy, chaotic, astonishingly beautiful place. I hope to demonstrate this with my series, which covers just 5 hours in Kolkata. "The car was briefly imported to the United Kingdom in 1992 (as the Fullbore Mark 10). The cars were retrofitted with a heater and seat belts in order to comply with European safety legislation, but only a tiny number were ever sold, and the importer went into liquidation." It looked at first as if that cyclist was pulling a cart load of hay Ray. Ray: I see what you see, Chad. 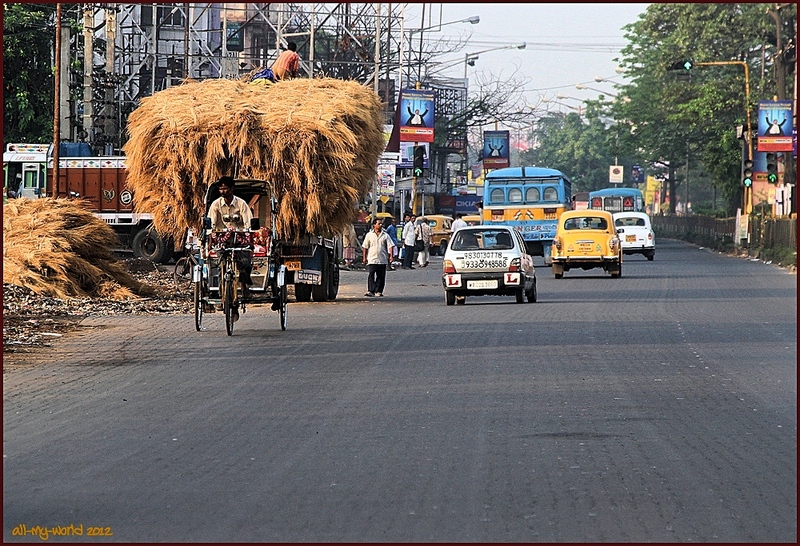 I'll show a few HPV [Human Powered Vehicles] in this series, as they are commonplace in Kolkata but eye-popping to a Westerner. Just as I imagine a road in that part of the city. How on earth do they keep all that straw on the lorry. Ray: I like the lack of lineage on the roads, Brian...makes the vehicle operators think a bit about how to share with all the others. The straw is being unloaded...I expect it had a couple of strong ropes holding the straw down while they were traveling in from the farms. it is indeed a wonder how those taxis have survived all these years, Ray. and i am curious if they will survive the ride hailing services. Ray: Production of new Ambassadors ceased in 2014, Ayush, and I believe there is a plan to have them all off the Indian roads within about 10 more years. I believe the Ambassador had a production run of nearly 70 years because the original design was strong and simple...not too much to go wrong, and things were easy to fix when they failed. Oh Dear! They're all driving on the wrong side of the road! #1. There are no lines, Mary, so there are no sides! #2. The civilised parts of the World believe this is the sensible way to drive! Ray: That accidental illusion amused me, too, Peter. ...hoping that nothing falls on you! Ray: You need to trust that your driver has everything under control, Tom.